No one knows who killed former Lebanese Prime Minister Rafik al-Hariri. We do know, however, that the main witness cited in the UN report, Zuhir Mohamed Said Saddik, “has been convicted of embezzlement and fraud among other crimes” ( DerSpiegel) which casts grave doubt on the credibility of his testimony. Indeed; lying can be a profitable choice when it serves the greater objectives of American-Israeli foreign policy. None of this suggests that Syrian intelligence wasn’t involved in the assassination. It very well may have been. It simply proves that the report of German prosecutor Detlev Mehlis is inconclusive and may have been the result of American coercion. At the very least, the report fits rather nicely with the Bush administration’s stated goals for regime change in Damascus and redrawing the map of the Middle East. If Mehlis was truly serious about finding out who the assassins really are, rather than carrying out a political vendetta for the United States, he would be devoting more energy to uncovering the details related to the white Mitsubishi Canter Van that carried the explosives. The history and origins of this van, which was stolen in Japan on Oct. 12, 2004, are critical to the investigation as journalist Robert Parry points out in his recent article “The Dangerously incomplete Hariri Report”. But, then, few who have been following the Hariri assassination have any misgivings about the real motives behind the Mehlis Report. The Hariri investigation is just the pretext for the forthcoming military action against Syria. Already the western press has swung into high-gear reiterating the blistering rhetoric emerging from the White House and its acolytes’ at the State Dept. Ambassador John Bolton, the Bush administration’s mad-hatter at the UN, has repeatedly threatened Syria with swift action although the facts are still uncertain. “This is true confessions time now for the government of Syria”, Bolton warned. As many have suspected, the volatile Bolton was dispatched to the UN to pave the way for war with Syria and Iran. His baseless attacks on Damascus have done nothing to disprove that conclusion. Fans of the much-maligned “paper of record” will be glad to see that Judith Miller’s chair at the Times has been filled by her equally-competent protégé, Warren Hoge. Hoge has already produced 4 front-page articles on the Hariri case invoking the same demagoguery, unsubstantiated allegations and damning insinuations as his mentor Miller. In essence, the Times has already condemned poor Syrian President Bashar al-Assad by framing the uncorroborated evidence in a way that excludes every other suspect and by repeating the constant refrain “sanctions” 7 times in one article alone. Judy Miller’s early retirement has not dulled the Time’s appetite for reiterating fictions on its front page. Predictably, no mention of the witness Sadik’s shaky testimony has appeared in any of America’s leading newspapers. So, what’s the game-plan? Can the Washington warlords really be considering another invasion just to depose what Paul Craig Robert’s calls a “mild mannered ophthalmologist”? The real reasons for regime change in Syria have less to do with Hariri’s assassin and more to do with oil and Israel. 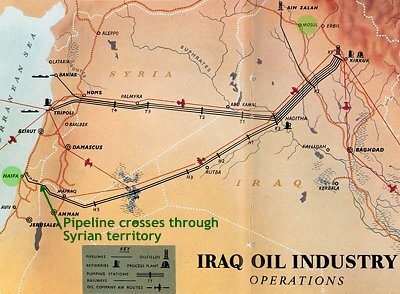 An April 20, 2003 article in the UK Observer, “Israel seeks Pipeline for Iraqi Oil”, clarifies this point. This is the driving force behind the confrontation with Syria. At present, Bashar al Assad refuses to normalize relations with Israel until Israel surrenders the land it seized in the Golan Heights during the 1967 war. Israeli hawks have no intention of returning the land and are planning to remove al Assad instead. It’s widely known that Israeli Intelligence (Mossad) is already operating in Mosul where the pipeline will originate and have developed good relations with the Kurds in the area. The only remaining obstacle is the current Syrian regime which has already entered the US-Israeli crosshairs. “Wipe out Syria”? That’s pretty blunt talk from a diplomat. Akins is not kidding. Washington and Tel Aviv are fully committed to toppling the Assad government. Many of the same people who are connected to the ongoing Fitzgerald investigation, (Wurmser, Libby, Perle, Feith, Hannah, Wolfowitz) authored a report outlining the neocon agenda in the Middle East for Prime Minister Benjamin Netanyahu in 1996. The report, “A Clean Break; A New Strategy for Securing the Realm”, campaigned for the very policies that are currently being executed by the Bush administration. The strategy calls for a “roll-back” of regional threats to Israel, help to overthrow Saddam Hussein, and striking “Syrian military targets in Lebanon”. To deny that America is now fighting Israel’s war is shortsighted to the point of blindness. The title of the Wurmser-Feith’s-Pearl document tells the whole story. “A Clean Break” conveys the message that Israel should abandon giving back land in exchange for peace with the Palestinians. (as per Oslo) “Securing the Realm”, however, is equally attention-grabbing in that it articulates the real objectives of its authors; to reestablish the ancient kingdom of Israel; a kingdom that will undoubtedly mean West Bank-type apartheid and Guantanamo-type justice for 1 billion Muslims in the region. Regime change in Syria is a crucial step to realizing that goal. Syria poses no threat to America’s national security. We have no dog in this fight. The real threat is those who now operate freely within the foreign policy establishment, using the US military to further their own self-serving objectives of controlling Middle East oil and securing an imaginary Israeli empire. Neither of these is in the national interest, and both have put America’s future greatly in doubt. As the above article states Syria posed “no threat to America’s national security”, but if a rationale could be contrived, if it could be portrayed as a sponsor of terror, then things would be very different. Such a rationale could be found by implicating Syria in Hariri’s murder, even if Assad’s regime had absolutely nothing to do with it. In which case, undercover MOSSAD operatives using another nation’s passports could carry out the assassination and the finger of blame could then be pointed at Syria. Leaving Israel without any apparent connection to the killing, as the following indicates. Lebanon’s Justice Minister Adnan Addoum said on Friday that authorities were hunting for twelve Australian men wanted over the assassination of former Lebanese Prime Minister Rafiq al-Hariri. Addum said that all the suspects hold the Australian passport and that six of them left Beirut for Australia hours after Monday’s deadly blast, adding that police found traces of explosives on aircraft seats. Hariri was killed in a huge explosion in Beirut which also claimed the lives of additional 16 people. The minister added that there are two more Australians who tried to leave Lebanon after the assassination but missed the flight for unknown reasons. Their location is not known. Interpol agreed to interrogate the twelve suspects, Addoum said. The minister didn’t provide further details and it was unclear what role the men played in the attack. Reports earlier this week said that the Australian government was helping Lebanon investigate Hariri’s murder. In other developments, Lebanon’s Tourism Minister Farid al-Khazan resigned, saying that his decision was in line with his convictions and his “obligation to the country”. There have been mounting calls for the whole Lebanese cabinet to resign over Hariri’s assassination. Also Friday, Syrian President Bashar al-Assad appointed his brother-in-law, Major-General Asef Shawkat, as head of military intelligence to replace retiring Major-General Hassan Khalil…article continues here.